It’s not hard to find nice places to live in the Pacific Northwest. This is a truly stunning part of the country, and excellent housing options abound. With that said, Sammamish is a tough option to beat. With a convenient location on the Eastside and plenty of natural beauty all around, many people work hard to afford property in this desirable city. You aren’t going to find a home in Sammamish when shopping on a tight budget – property values here are quite high – but those with the means to make a purchase will love the options available. Sammamish is not a big city, but there are some options with regard to where you will want to live within the area. Would you like to live near a golf course? Sahalee Country Club and The Plateau Club are both attractive options offering quality golf courses and beautiful settings. Maybe you’d prefer to live closer to the water? No problem – you can just head down off the hill and toward Lake Sammamish to the west. The majority of what you are going to find throughout Sammamish are single family homes, however there are some townhomes and condos to consider, as well. 228th Ave NE is the main road running north and south through Sammamish, and attractive housing options can be found on either side of this road. It is often families that are drawn to the city of Sammamish thanks to the quiet way of life, excellent schools, and abundant recreational opportunities. Eastlake and Skyline High Schools both serve the area, as well as quality schools for children of a younger age. Soaring Eagle Regional Park is east of the residential portion of Sammamish, and it provides ample space to get out and explore nature. If you have young children and are looking for a great Pacific Northwest location to set down roots for the years to come, Sammamish is going to be a great choice for many reasons. You’ll be able to enjoy many of your days without even leaving the city of Sammamish once you move in. With that said, a bit part of the appeal of living here is what you will find when you do explore further around the region. I-90 is only a few minutes to the south of most Sammamish locations, meaning you can quickly head toward Seattle or up Snoqualmie Pass and into the mountains. 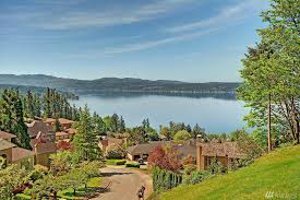 You can also go north to Redmond and around the other side of Lake Sammamish to Bellevue for all of the dining and shopping options that it presents. If you are drawn to the Eastside lifestyle for both work and pleasure, it’s hard to beat Sammamish. Not only is this city a great place to call home on a day to day basis, but it also serves as a perfect jumping off point for exploration around the rest of the Puget Sound area. As you get ready to start your Sammamish home hunt, be sure to contact an experienced real estate agent who is intimately familiar with the city and surrounding areas. Having the right agent on your side can make all the difference.